"One thing I've learned is that your attitude determines your altitude. If you have a good attitude, you are positive and persistent; then you've got a good chance to be successful. 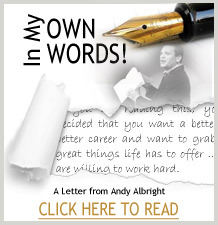 Taking Andy's Albright Challenge will help you get started on the road to success." "I have been around Andy for more than half of my life and his Albright Challenge falls in line with what he has taught me for so many years. If you are looking for a way to grow personally and professionally, I encourage you to sign up for the Albright Challenge." "I've worked closely with Andy for the last couple years and I know how powerful the Albright Challenge will be for people, because it's actionable steps that Andy uses in his own life. I would recommend this program to anybody looking for rapid growth in their life."